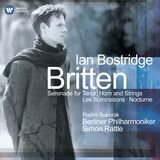 Serenade for Tenor, Horn and Strings, Op. 31: IV. Elegy, "O Rose, thou art sick!" Serenade for Tenor, Horn and Strings, Op. 31: VII. Sonnet, "O soft embalmer"
Serenade for Tenor, Horn and Strings, Op. 31: V. Dirge, "This ae nighte"
Serenade for Tenor, Horn and Strings, Op. 31: III. Nocturne, "The splendour falls on castle walls"